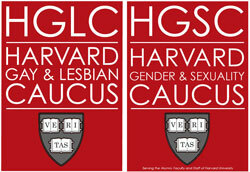 In 2013 the Harvard Gay and Lesbian Caucus decided to change its name to the Harvard Gender and Sexuality Caucus. These are the reasons why. In 2013 the members of the board of directors of the Harvard Gay and Lesbian Caucus decided to change the name of the organization to the Harvard Gender and Sexuality Caucus. They did this to more accurately reflect the diversity of the membership, and to respond to increasing feedback that its former name did not represent all those who constituted the Caucus. Like many LGBT organizations that started in the 1980s, the original name reflected its founding gay and lesbian membership. Over the years the membership came to include a diverse spectrum of people, including bisexual, trans, heterosexual and gender queer individuals, all of whom were seen in the chapters, the board, and the Harvard community at large. The board heard increasingly from the HGLC membership that a name that said just Gay and Lesbian was not up to the task of representing the group, and that like many other organizations, they should consider a new name. They began a process of reflection, consultation and discussion that ultimately led to the decision to change the name. Firstly, and most importantly, they felt that the HGSC would more accurately describe who they were and the kind of community the Caucus strove to be. The board was and is committed to diversity, and felt this name included and represented the full spectrum of lesbian, gay, bisexual, trans, queer, and straight students, faculty, staff, and graduates of Harvard University, who were our constituency. They felt, and continue to feel, that if the Caucus were to attract and retain new members, especially the then current students who were graduating from Harvard, and who represented the future of the organization, it was important that the Caucus reflected the kinds of communities that contemporary students had been a part of, the ways that LGBTQ people self-identified, then and now, and the issues important to them. Secondly, the name HGSC aligned our organization with the academic community at Harvard University, specifically, the Committee on Studies of Women, Gender, and Sexuality, the home of undergraduate LGBT studies. The terminology was not only expansive, but was familiar to those on campus and in academia more generally, and to those to whom it was unfamiliar, invited them into a conversation about this important area of study. It was, and remains, one of our primary aims as an Alumni organization to support LGBT studies at Harvard, and the board felt this action contributed to that goal. Thirdly, the board felt the name HGSC retained a connection to the original name, the Caucus, which means a diverse, mobilized group coming together, and was central to the organization's history. The similarity to the former HGLC abbreviation provided a familiarity to the new moniker, and preserved an identity in a way that we felt was recognizable to our current members, to the Harvard Alumni Association, and to the Harvard Administration. We hoped this name would help bridge our membership from the name with which we were all familiar and our new name. The board struggled over the decision to change the name, especially since the organization under its former name had such a long history, and to many members, it was not only familiar, but associated with the many and remarkable achievements of our organization. It was, however, becoming increasingly evident to the Board that it was the right thing to do. It was not a simple task to find a name that represented the diverse community and values of the HGLC. They considered simply adding to the HGLC acronym, there has not any clear consensus about whether they should also specify transsexual, intersex, queer, and questioning members. The members of the board were also quite concerned about how to keep the name from becoming increasingly unwieldy with too many letters, like the HGLBTQAC. While the undergraduate group had just gone to the Queer Student Association, many of the HGLC members were strongly opposed to that term, and to the painful connotations it brought to them. For that reason using “Queer” was not an option they could use. They concluded that the name Harvard Gender and Sexuality Caucus, or the HGSC, because of its unique capacity to maximize inclusivity, maintain visibility, align with the academic studies at Harvard, and reference the organization's history and past, was the best option to take. We the current members of the board welcome you thoughts and feedback on this.